While tips and strategies have been helpful in my simplicity journey, nothing inspires me more than reading real stories, hearing real joys, and getting a little glimpse into the life of someone striving to be more with less. It is our stories that heal, motivate, and inspire. I love sharing the big changes in my life, but they all come down to hundreds of small steps and stories. Each small story has a place and has contributed to my transformation. Think back over the last few years and reflect on your stories. They all made a difference, and you are connected in some way to each of them. So, I had this idea, a way to use our stories collectively to move others (and each other). This is for bloggers and non-bloggers alike, and espeically for those of you who want to inspire but don’t know how to reach people. As a community, let’s start a movement on Instagram. Let’s inspire others to simplify their lives with the power of our stories. Consider this a community micro-blog experiment. You don’t need a special talent or expensive equipment to participate. All you need is the camera on your phone, words from your heart, and a little vulnerability. 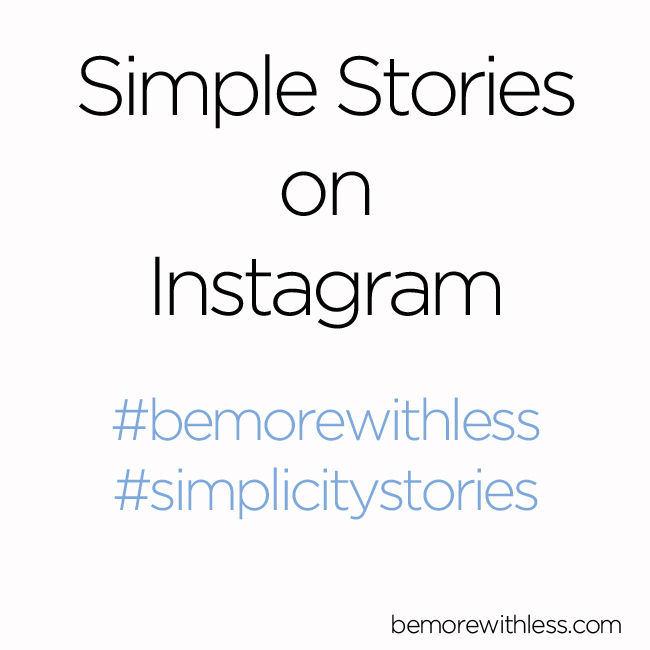 Share your stories with a little glimpse into your simplicity journey. It might be a big hero’s journey, or a small story about your simple lunch, morning routine, or any of the small, meaningful stories in between. You can share more than one story about how simplicity is part of your life. Share one a day, or one a week, or whatever makes you happy. I’ll be searching for your simple stories on Instagram using the hashtags, sharing them and connecting with you. If there is enough interest, I’ll do a roundup post next month right here on the blog featuring some of your beautiful stories of simplicity. Spread the word too. This is a movement after all. This movement doesn’t have official rules about how many words to post, what kind of images to share, or a specific end date. I do recommend sharing your complete story on Instagram instead of asking people to visit another link or site, but otherwise, let’s just let it unfold. You might be just starting to be more with less or like me, you’ve been at it for a few years. Wherever you are, your stories have power. My stories may have resonated with some of you, but they don’t meet everyone where they are. Your stories can bridge that gap and together we demonstrate the power of simplicity. You can find me on Instagram here: @bemorewithless and once you complete the steps above, you are welcome to comment below with your Instagram handle. Where do you find every inspiring idea from, Courtney? This is brilliant! Thanks Anki, I’m so glad you like it. Wow I love this idea. Its a pity I am not on instagram. Your blog has helped me with so much in my life. Such a sweet idea…can’t wait to follow along. I’ll be sharing at @go_litterless, where I post about time spent outdoors / zero waste / everyday sustainability / minimalism. Yay! Looking forward to your stories. I love this idea. I already do a good amount of sharing about simple living on my Instagram account (@quiethabits), but I’m going to share some of my personal stories this month. Thanks for starting the movement Courtney! So glad you are participating Nathan. Any possibility of also doing something like this on Facebook? As part of my own simplicity activities I have chosen not to do any other social media, and likely others are in the same situation. Maybe a public community page??? Beverly, for now this is going to be Instagram focused, but it could evolve into something on Facebook. I think Instagram is much less distracting than Facebook, but completely understand why you’ve decided to streamline your social media platforms. Thanks Courteney for this initiative to form a great movement for people like me who loves Simplicity and having less is truly my idea and way of life too. Looking forward to connect with you on Instagram. All the best and God bless. 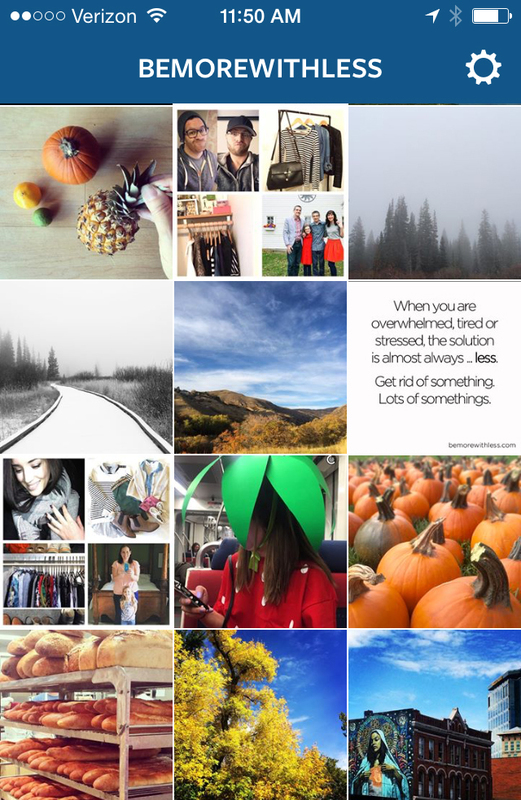 I love the idea but agree with the comments about Instagram. I follow your blog and get the posts both by email and on Facebook; I am not on any other social media platform and don’t intend to be. Why not just have comments posted on your blog? Thanks for the recommendation Kathryn. We are going to start off on Instagram, and see how it goes. I will be sharing some of the stories here on the blog too. Hey Courtney. Trying to participate, but with my low tech brain I’m having a difficult time posting a story to instagram. Keeps saying caption is too long and it’s well under 2000 characters. Any suggestions? Thanks! Hi Jeanne, I’ve never noticed a character restriction, unless you are creating your profile. Once you post a new image, I think you can write as much as you’d like. I’m low-tech too though, so maybe Instagram has a help feature? I may have to break down and join Instagram just so I can post my entry. I already know what pictures I want to take and what caption I want to include but I don’t know anything about making a collage or posting to Instagram. Add to that my reluctance to add another platform and it may never happen. Linda, What I love about Instagram is that it doesn’t take a bunch of time. You could post one image a week or more or less, and then let it go. I’ll be curious to hear what you think. You always come up with great ideas. I am honored to be part of this endeavor. What a beautiful way to spread the simplicity message. Will be a great way to connect with others on a simplicity journey. I also love the personal stories, they are what inspire, motivate and ground me.